For veteran gardening professionals, the name “Japanese Beetle” probably sends chills down their spines. That’s because these are the most devastating pests for urban landscapes in the country, and feeding time begins in June, according to the entomology department at the University of Kentucky. Imagine you spend all of your free time preparing a garden only to have it ransacked by these tiny scavengers. They’re not only a pain in the neck, but there’s not many simple solutions to get rid of them. Before we talk about removal remedies, let’s take a closer look at the Japanese Beetle. While the lifespan of this little sucker is only 30-45 days, they can wreak quite a bit of havoc. Their activity lasts between 4-6 weeks when they’re busy feeding on approximately 300 types of plants, eating leaves, flowers, and over-ripened fruit. The worst part is they’re usually not alone, and when they work with accomplices, the wreckage is that much worse. They may be small, but they can leave a big mess after they’re done feeding on your garden. It’s a good idea to know what kind of plants are vulnerable and try to limit those types if you can. If you’re hell bent on including those plants anyway, it may require constant upkeep to make sure everything is growing according to plan. When you have problems with these little destroyers, a call to a Portland arborist should definitely be in the cards to get some help. They’re experienced dealing with these plant predators and they’ll be able to give you some options to get Japanese Beetles to stop pestering you altogether. Don’t try to be proud and do everything yourself. Some things are best left to the professionals, even if that means swallowing your pride in the long run. One thing they’ll likely suggest is for you to be careful when selecting landscape plants, which could be tough since Japanese Beetles like to feed on approximately 300 different types. A professional Portland arborist should have some ideas on what would work best for your home and for the area. If you pick one that’s not a common feeding ground for Japanese Beetles, your problems should go away, or you can just come to the realization that you’re going to be doing constant maintenance to keep your garden protected from these predators. You can also pay for someone to come and remove them, but that doesn’t solve the long-term problem. Even if you pay a professional to come to your home and remove the Japanese Beetles, and even if the contractor gets them all, that plant could be susceptible to another similar assault in the future. The goal should be to eliminate the problem altogether, but it’s not that simple. There’s also chemical remedies or even Japanese Beetle traps, which are sold at most garden centers. Again, this is a temporary fix and will deal with the immediate problem. You don’t want to be reinvesting these resources in a year. That almost defeats the purpose. You can also use row covers to protect your plants during the typical Japanese Beetle’s feeding period. You can make them yourself or buy them at the store, but it could get a bit pricey. Unfortunately, if you are trying to figure out DIY remedies, manual removal seems to be the most universally effective, but that is unpleasant and time-consuming. And it’s possible that even after getting on your hands and knees, these ferocious bugs will return for another go at your garden down the line. Ultimately, it’s best to let the professionals handle a situation like this. So ask your friends to recommend a Portland arborist. Make sure to ask them for references and proof of insurance. This way, if there are any issues, you and your family will be covered. Also, remember that insecticides should always be considered a last resort. If we’re talking about a vegetable garden, insecticides are out of the question, but they could be effective with other types of plants. If you’re unsure, head on down to your local garden center and ask somebody there for a recommended product. 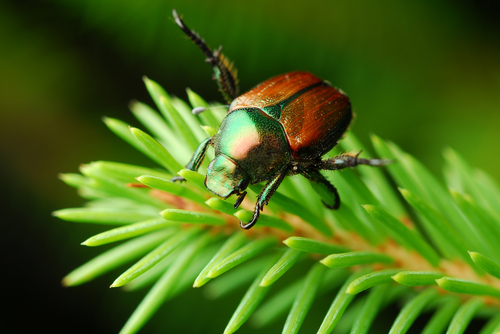 If you want to be protected from the Japanese Beetle, make that phone call and consult a Portland arborist to come and take care of the issue. Sure, you can save some money by doing some of the things we mentioned, but this is likely a case where you should just bite the bullet, let the professionals do their work and step back because being a proud do-it-yourselfer might not get you too far in the long run. Also, remember that your arborist can help you deal with any residual damage caused to your trees, so keep the number handy.